One of my long-standing critiques of the way that gender equality has been approached in the U.S. is the over reliance on codifying equal opportunity. The question always comes up — “equal opportunity for whom?” In this post by Caroline Frederickson of the American Constitution Society for Law and Policy, I was stunned, yet again, by the depths to which private employers will go to extract the most labor from workers for the least cost. And when I say “labor” and “workers,” we’re talking about actual human beings — people — with their own basic needs, aspirations, families, and bottom lines to look out for. As Ms. Frederickson reports, “because of lack of bargaining power in a weak economy, employees find themselves at the mercy of companies that have adopted a just-in-time system, meaning they keep a pool of workers on call subject to the demands of management.” Having to call-in to find out whether you have work today means that people can’t even count on a weekly salary, much less plan for the things that make employment possible, like affordable, quality child care or transportation. And it should be no surprise by now that it’s women who bear the appalling human, financial and environmental costs of our “free market” race-to-the-bottom economy. It seems sacrilege to question the importance of equal pay, pregnancy non-discrimination and the like. While policy guarantees to those effects can create some safeguards for women workers, they don’t do anything to alleviate the burden of reproductive labor and care work that still falls pretty squarely on women’s shoulders. Employers may incur short-term increases in their costs, but this in no way shifts the dominant workplace culture that can be downright hostile to employees’ personal and family needs. Hooray that women can still work while pregnant. But for someone who has actually been pregnant, pregnancy alone is a colossal physical, mental and emotional job in and of itself, not to mention the human being you get at the end of it. This is tough enough when you have a desk job; more than daunting if you’re in one of the many gendered professions that countless women find themselves in — low-wage work, care giving, teaching, nursing, to name a few. And though I think we’re not supposed to admit it, trying to producing “equal work” compared to that of non-childbearing male peers is a sure-fire recipe for feeling like a constant failure and stretched beyond your limits in every part of your life. 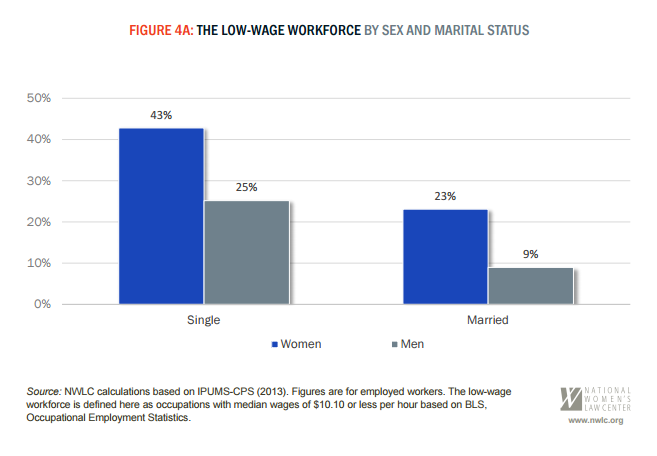 Read more: Behind the pay gap between men and women.